Do You Need Mulch? YES! Here’s Why. Mulch is about so much more than curb appeal. So, is mulch necessary? Yes. Do you need fresh mulch every year in Ohio? Yes. Do we consider mulch a must-have? Absolutely, if you want to take care of your commercial grounds as an asset and preserve the value of your landscape. Let’s talk about when is the best time to mulch, and two factors that impact the price of mulch: type of mulch and how mulch is applied. When is the best time to mulch your Ohio landscape? Mulch tends to fade as summer wears on and you can lose some coverage during typical fall cleanup. 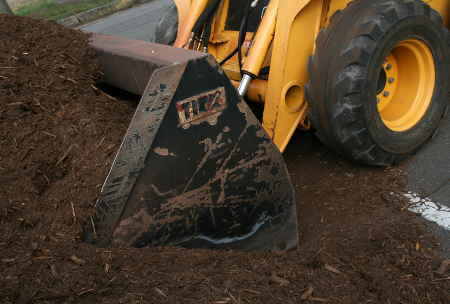 During Ohio winters, mulch can break down into the soil. By spring, it’s time for a fresh layer. So, when should you mulch? Mulch should go down after spring cleanup and weed control/fertilizer. Spring cleanup removes debris from beds, next comes weed prevention and plant nutrition. Finally, we apply mulch to reinforce weed suppression and to protect the soil and plants. One thing to consider: If your property includes flowering trees and shrubs that are blooming now and will drop petals, you might want to wait until plants cycle through the spring bloom. While spring is an ideal time to mulch, some commercial property owners also find that fall mulching adds extra protection to their property and helps prevent winter damage. 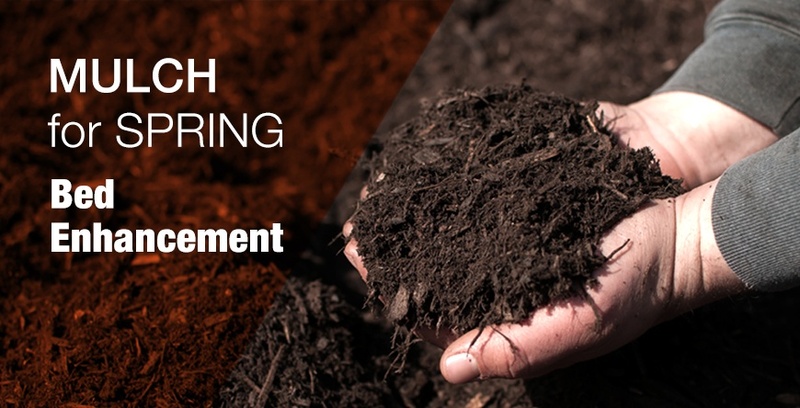 Even with a spring application, some properties might need an additional fall layer of mulch to stabilize soil temperatures and help retain moisture during the cold season. 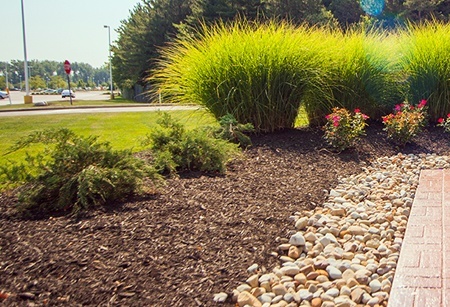 There are various types of mulch for commercial properties, but what’s best for your landscape? The most common types of mulch used in Northeast Ohio are bark, hardwood and premium mulch that contains compost. Bark: Bark mulch comes in different sized nuggets and is great for pathways and play areas. Because of its larger pieces, it is less effective at retaining soil moisture and regulating soil temperature. 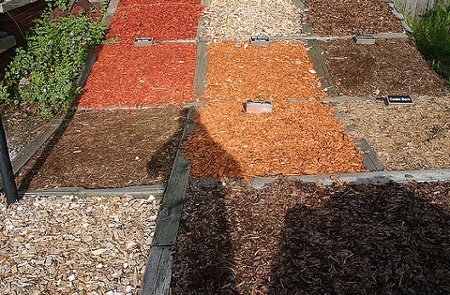 Hardwood: Shredded hardwood mulch is the most affordable and widely used. What we like about it is that the shredded hardwood stays put on slopes (as opposed to nuggets that can “roll”). It is slow to break down into soil. But because of that, hardwood mulch can compact and block rain and nutrients from reaching soil. Hardwood mulches tend to make soil more alkaline, which should be considered when fertilizers are applied. Premium Dyed Bark Mulch: Our premium mulch is triple-shredded so it spreads evenly and dyed for a rich color. It also includes compost that breaks down gradually into soil, adding important nutrients for plants. Basically, this is mulch with benefits. It is an upgrade from typical bark or hardwood mulch, but you’re getting more value from the mulch because it’s working harder for your landscape. As with any service, manual labor requires more time and resources—and more time increases the price. Whenever we can mechanize a process, it improves efficiency and can decrease the price. Landscape beds that contain lots of plantings and smaller spaces need to be mulched by hand. Our team will use wheelbarrows and tools to spread the mulch, ensuring proper coverage and depth. At Schill Grounds Management, we think of every landscape as an asset and the services we provide as a type of insurance. We not only protect your plants and grass, we enhance your property and increase its value. So, is mulch necessary? Yes, if you want to optimize soil health, keep plants healthy and prevent damage from the environment and everyday traffic on your property. The good news is you have mulching options, so you can adjust the type of mulch, and way it is applied, to suit your budget and property’s needs. Let’s talk about how we can enhance your property today so you’re ready for summer. Call us any time at 440.327.3030, or fill out this simple contact form and we’ll get in touch with you. Have customer feedback for us? Use our new customer experience form to provide feedback on how we can improve your services or any issues you may be having.